The <datalist> tag used to specify the set of pre-defined values for an <input> tag. The <datalist> tag used to create an “autocomplete” options for <input> elements. The <option> tag used to specify the options in the data list. <datalist> tag belongs to Flow content and Phrasing content. <datalist> tag supports Global Attributes and Event Attributes. HTML4 does not support <datalist> tag. <input> tag used to get the input from the user. <datalist> tag used to display a drop-down list specify the set of pre-defined values for an <input> tag. <option> tag used to specify the list of options in the datalist. 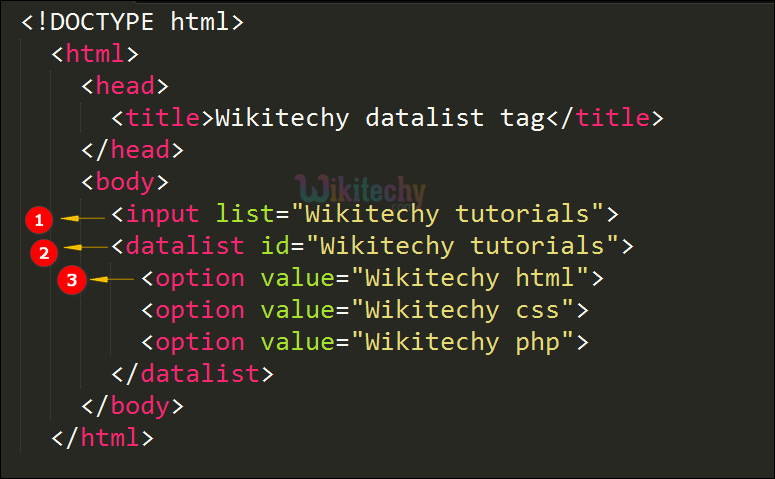 The output displays the pre-defined terms in the datalist as “HTML”,”CSS” and “PHP”.